The present Survey is the twentieth in a series of reports prepared annually by the secretariat of the Economic Commission for Asia and the Far East. A major object of these Surveys, and of the quarterly Economic Bulletins which supplement them, is the analysis of recent economic developments in, and affecting, the countries of Asia and the Far East in so far as these developments are shaped by, and help to determine, their policies. It has been the established practice since 1957 to examine in the annual ECAFE Survey a specific problem relating to the economies of the region, in order to study long-term trends and their implications for national policies. 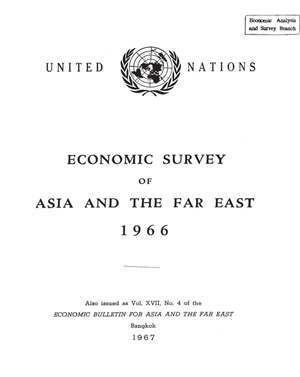 The present Survey contains, in Part One, a study on aspects of the finance of development; this is followed by Part Two in which the economic developments in the ECAFE region in recent years, particularly in 1965 and 1966, are reviewed on the basis of information available to the secretariat up to the time the Survey was written (February 1967). The Survey is published solely on the responsibility of the secretariat and the views expressed in it should not be attributed to the Commission or Governments of member countries.